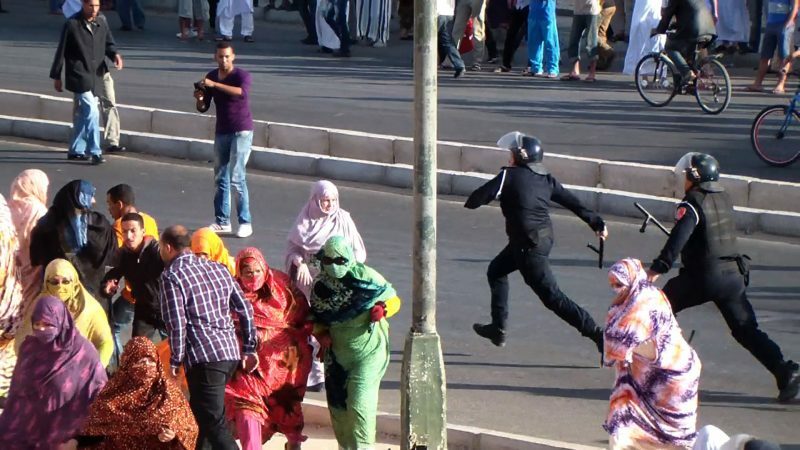 A Sahrawi crowd in Laayune, Western Sahara, is charged by Moroccan anti-riot police in plainclothes. It is not uncommon for police to outnumber the protesters. Screen capture from 3 Stolen Cameras. Stories about life in Western Sahara — a disputed territory controlled by the Moroccan government — are rarely told by people who live there. In a militarized environment with aggressive controls on media and citizen reporting, few stories of Western Sahara reach audiences beyond the immediate region. But a new documentary film that charts one independent media group’s struggle to document human rights violations in Western Sahara has the opportunity to change this. The film, 3 Stolen Cameras, had its world premiere at the DOK Leipzig Documentary Film Festival in Germany last November, despite threats of censorship and funding challenges. The 17-minute short film produced by the Western Sahara media group Equipe Media and the Sweden-based film production collective RåFilm, is both by and about Equipe Media. It features footage taken by Equipe Media in Western Sahara since 2009, but was edited and post-produced in Sweden. 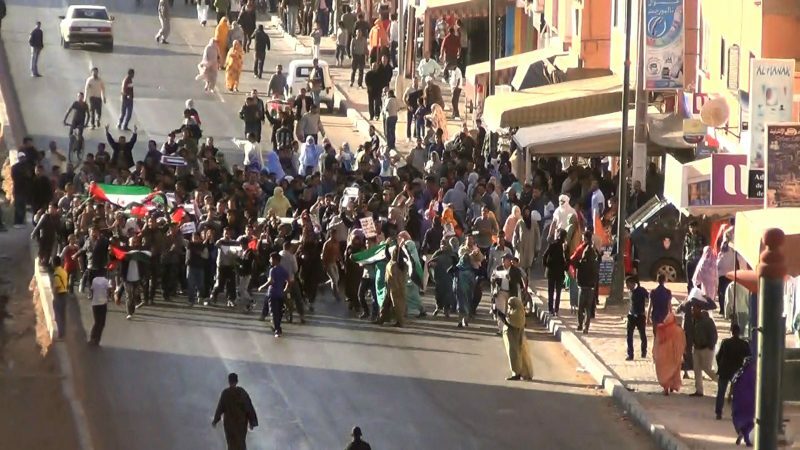 The film gives audiences a close look at Western Sahara under Moroccan occupation through the lens of Equipe Media as they film protests and collect testimonies on human rights abuses, often while hiding or running from police. The conflict in Western Sahara dates back to 1975 when the former colonial power Spain withdrew from the sparsely-populated territory and joint forces from neighbouring Mauritania and Morocco moved in to take control. While Mauritania eventually withdrew from Western Sahara, Moroccan forces to date still control what is sometimes referred to as ‘’Africa’s last colony’’. For 16 years, the rebel group known as the Polisario Front fought a guerilla war for independence against Morocco, before a UN brokered ceasefire came into effect in 1991. The UN recognizes the Polisario Front as a legitimate representative of the Sahrawi people, a mixed ethnic group that lives mainly in Western Sahara and Mauritania. 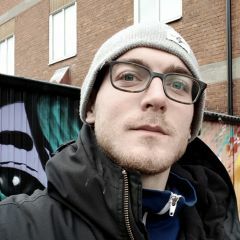 3 Stolen Cameras – TRAILER from RåFILM on Vimeo. 3 Stolen Cameras found its way to film festival in Leipzig after several years of hard work across multiple countries, languages and legal hurdles. Some years ago, RåFilm and Equipe Media became connected through a local Western Sahara solidarity network. Soon after the release of the Palestinian documentary film 5 Broken Cameras, which was nominated for an Oscar in 2013, the idea for 3 Stolen Cameras came about. While the story in 5 Broken Cameras is structured around the destruction of the cameras of a Palestinian farmer and activist as he tries to document a protest-movement in his village against the confiscation of agricultural land by Israel, the Sahrawi film is structured around 3 cameras that were confiscated by Moroccan authorities from Equipe Media activists as they were filming protests in Western Sahara. Both films tell of struggles to document and shed light on violations committed under occupation. As a production by an activist media group that challenges the Moroccan government’s narrative regarding the Western Sahara, the team behind 3 Stolen Cameras have at times found itself caught in a propaganda trap, where the underground journalism of Equipe Media and other counter-narratives are discarded as vested interests. Despite the fact that the dismissal of such a key counter-narrative only reinforces the one-sided Moroccan information blockade imposed in the name of neutrality, the film’s producers faced funding challenges. Sometimes it was like those funders requested that RåFilm would take it over completely, like they hoped that we would make something more artsy and less political from it. To me that would be such a weird thing to do with a powerful material like this. We participated with Equipe Media in a panel together with some Arab Spring journalists and it is striking how they are all really activists at the same time. But here in Sweden it’s like you can’t, it’s something frowned upon being an activist when you work with media. That’s actually really absurd when considering that we are supposed to be the democracy here! In October 2017, the Beirut International Film Festival (BIFF) announced that they would host the world premiere of 3 Stolen Cameras. This was a great victory for the filmmakers, as 3 Stolen Cameras is intended for an Arab audience, with narration in a standard Arabic-speaker voice. Soon however, the festival staff began to express concern that the film could be censored. According to the film's producers, BIFF staff dissuaded Equipe Media’s representatives from even attending the festival, for fear this might draw unwanted attention from authorities. A pro-independence rally in Laayune, the capital of Western Sahara. Equipe Media camerapersons typically position themselves on rooftops in order to safely record and witness scenes on the streets. We are saddened to announce that “3 Stolen Cameras” from the Rejection Front – Public Square selection has been censored and hence will not be shown. The festival provided no further details as to the cause or the party behind this censorship decision. The film’s producers say that the Moroccan government pressured Lebanese authorities to censor the film. Local media in Morocco reported that the Moroccan ambassador to Lebanon reached out to pressure six different departments of the Lebanese government to ban the screening. All six complied and demanded that the festival cancel the premiere. Local news website le360.com described the film as “undermining” Morocco’s claim to Western Sahara and insinuated that the film was actually staged and recorded in Algeria (which supports the Polisario Front). The article made no mention of Equipe Media and RåFilm. In my mind censorship has a very negative connotation so if imagining myself in the role of the censoring power I assumed it’d be something you want to keep quiet. Interestingly, to Morocco that wasn’t the case at all, it was more like they were bragging and detailing how they went about it. In our conversation, Anna-Klara suggested that the Moroccan government's response to 3 Stolen Cameras should be regarded as a proof of quality for their project. The film's censorship in Lebanon only increased public intrigue around the film. Soon after the BIFF incident, 20 international film festivals signed a petition of protest against the censorship of 3 Stolen Cameras. Soon after, the DOK Leipzig Documentary Film Festival became the official host for the world premiere of 3 Stolen Cameras. Although not this did not give the film the Arab audience it was made for, DOK Leipzig was nevertheless a prestigious alternative. 3 Stolen Cameras was received well by the audience and got nominated in competition for best short film. In due time, after the festivals have had their chance at exclusive premiership, the film will be released for online streaming and then finally available to local audiences in Western Sahara.